A eucalyptus known as the “Big Tree” has been chopped down at San Luis Obispo High School as part of a planned remodel of the campus, upsetting numerous members of the community. The old eucalyptus served as a gathering spot for students. A petition to salvage the tree garnered more than 1,650 signatures. San Luis Coastal officials said the eucalyptus tree was unsafe. However, district officials also announced plans to replace the tree with a new student support center and performing arts building. The district likewise announced plans to remove a large Heritage Oak and other trees located at the northern edge of the SLO High School campus and replace them with a 12-classroom building. District officials say there are few, if any, places to build on campus, and they need to meet the expanding needs of students. San Luis Coastal’s tree removal plans prompted protests, including a tree sit-in, which took place last month. Nonetheless, the district is proceeding with removing the trees. On Monday, Brian Dzukola, a SLO High parent, posted photos on Facebook of what is left of the eucalyptus tree. 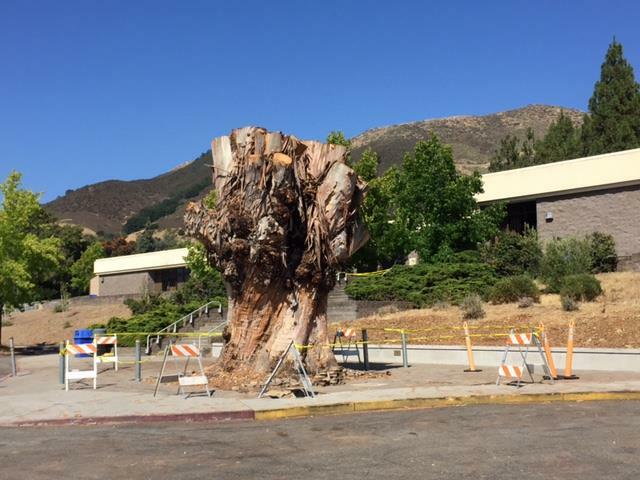 “It’s a sad day at San Luis Obispo High School when the Big Tree is officially gone!” Dzukola wrote. You can still skate the 2 10 stairs! I have many years of memories skateboarding with my friends here. I could care less about some tree. When Alexander graham bell invented the light bulb, these same type of people lamented the death of the candle. It’s a tree, and a nonnative, disgusting one at that. Get over it.